Everyone wants their wedding to stand out from the crowd, but let’s be real for a second — this just isn’t popular. There will always be weddings that shine a little brighter than the others, so make sure yours is one of them! One of the best ways to do this is to literally make your wedding a little brighter by incorporating as much color as possible. Now, you might be wondering how possible this is when the woman is tied to a white wedding dress and the man a suit, but there are actually plenty of ways to add some color to your big day. We take a look at five ways below. When it comes to decorating your reception area, make sure you have plenty of balloons and flowers dotted around the place. These both work effectively because they don’t draw the eye towards them, necessarily, but rather blend into the background – with all their color intact. They provide the mise-en-scene, if you will, a colorful look without being overbearing. 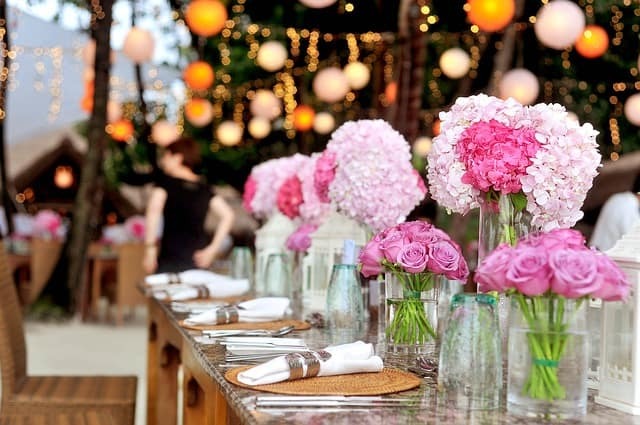 In any case, you’re likely to have flowers at your wedding anyway, so you may as well make them colorful. What everyone wears to your wedding is going to give the event it’s look, so spice things up a little by encouraging touches of color. Now, no-one wants (or should want) to get married in a red suit or anything other than a white dress, but there is still potential to add something bright and beautiful to your outfit. For the groom, it might be wearing socks with a funky color, or a bright flower on the breast. The bride might wear a flower in their hair. For your guests, you should mention in the invitation that the dress them is classy but colorful. The photos will be great. What’s behind the bar? The standard bottles of champagne will be there, but what about your cocktails? And not any old cocktails: brightly colored ones. Your party is going to be as bright as can be if everyone’s walking around with bright red and blue drinks in their hands. You might have had a mostly serious and formal ceremony, but when it comes to the party, the gloves should be off. Now that the essentials of the day have been taken care of, you’ll chance to overload your wedding with color. Confetti, for example, will shower your party with bright colors, while sparklers can literally brighten up proceedings. Get them from Direct Sparklers, and have them on the table for your guests to pick up. You can have your photographer and guests take long-exposure snaps of people writing with them in the air, ideally with heart shapes. Finally, think about your decorations and accents. Here you’ll have a lot of potential to mix in some color. Even things like your napkins and tablecloths can provide another opportunity to inject a bit of color into the day. Everyone opts for light colors – go bright!